As we were entering the rear door of the reception area I looked up into a tree and saw an unusual bird. I can’t tell you what type of bird, something that looked like a cross between a parakeet and a sparrow. It was luminescent, stunningly breathtaking (well, to me anyway). 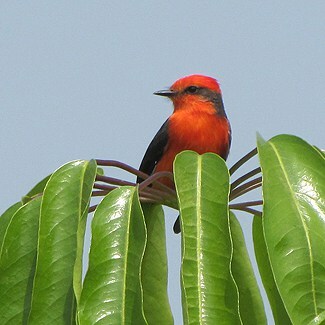 The bird’s dominant color was a deeply, evenly toned, yet vibrant red. Thin lines of black seemed to have been painted on areas of its body as to highlight its beauty. It was in that moment that I, you might say, quite literally, lost my mind. I reached into the backpack of equipment I keep with me wherever I travel for my still camera. The entire time I was reaching for the camera I was keeping my eyes focused up into the tree on the bird. My lack of attention to the immediate task at hand, retrieving the camera, had me fumbling for it clumsily. My eyes were locked onto the beautiful red flier in the tree above my head. I finally managed to get the camera out of the backpack. I hit the power button, aimed and took a quick shot. I always do this with birds because you never know if that one shot will be the only one you have a chance to get. Birds have a tendency to not be the best at posing for pictures. I was right. Within seconds it lifted off, flew away and alighted to another tree at the other end of the campus. I was now, mindlessly, running across the campus’ lush green lawn, leaping over small bushes and avoiding near collisions with statues of various female saints. All of this for the sake of capturing another image of this tiny creature’s radiance. The bird rested on a leafless branch. Quickly, while still in motion and not focusing, I snapped another shot off. To my surprise, it remained on the branch a little while longer, just long enough for me to get two more pictures. I was delighted! Excited! It then took flight again, back in the direction of the tree across campus where I had originally spotted it, and, once again, my feet, without permission, took chase. I didn’t think about it until much later (and I felt really bad about this when I did finally think about it) but, I was trampling all over this school’s painstakingly manicured grounds. All of this for the sake of capturing, like some sort of an addict, “one” more shot, just “one” more. The bird began to feign flight away from the tree, stop mid-air and then, just when I would start running in its direction, abruptly alter its flight pattern and return to the tree. It did this several times, each time returning to a different branch. It had me starting and stopping, changing directions attempting to chase it. It was at this point that I had the epiphany, “This little bird is toying with me!” I was being made to dance like a puppet on a string. I did have one redeeming moment of clarity during this “narrow minded performance of me” for the world. As I was running, I began pulling the camera up towards my face with the intention of focusing the shot while in motion to avoid losing any time during which the bird might fly away again. I am very proud to say that I lowered the camera, realizing that I was headed towards an inevitable tumble over a bush or face plant into one of the awaiting trees. When I reached the tree, to my surprise, it remained seated in that one spot. There was the most enchanting, blue sky as a backdrop to its perch. It was posing! This bird was actually posing for me! In my excitement, I had lowered the camera and was just standing there staring at it. The thought of potentially losing the shot woke me from my stupor. I fumbled to get my camera in place, and focused. I took my time in this moment and did not rush. I was willing to take a chance that I might not capture the paralyzing image before me. It remained stationary as I zoomed in. I inhaled deeply and then exhaled as I took the shot. I got it! I actually got the shot I wanted! Hysteria took possession of me and I felt an overwhelming “need” to dance. I’m not sure if I did or not, but a celebratory dance was definitely emanating from somewhere deep inside of me in that moment. I laughed to myself as I slowly came back down to reality. I had captured enough shots and didn’t want the universe to see me as greedy. I stood there staring up at the bird. The voices of the children yelling my name from surrounding classrooms re-entered my ears. Had they been screaming this whole time? How was it that I had not heard them? She had that curious, perplexed look that children get when the world isn’t quite right and they need an adult to set things straight for them. The three of them giggled and then ran off in the direction of the classrooms. The three little wise ones had helped to lift the cloud of narrowed focus that had temporarily blinded me to my surroundings. A couple of nuns were standing at the far end of one of the walkways, just standing, observing as you would imagine nuns doing. My tour manager, a few teachers on break and our school contact stood over to the side, all eyes on me, each face possessing pleasant, unreadable, smiles. Even if I could, I would not change a thing about what had occurred. Never does a picture capture the brilliance and beauty of what is before us in life but, at least, I’ve got something to share with all of you.